Away from the mainstreams of Jaisalmer city, Ratnawali desert camp is a solitary world in its own. The desert camp is a sweet blend of the raw luxury of Rajasthan and a camping experience that makes living in the desert a total bliss. Many might consider themselves ill fitted for desert camping, but here is a word of advice, at Ratnawali, comfort lies in every corner. The desert camp highly speaks of its Swiss made accommodations, which take care of every need of the traveler, no matter if you check in alone or in a group. 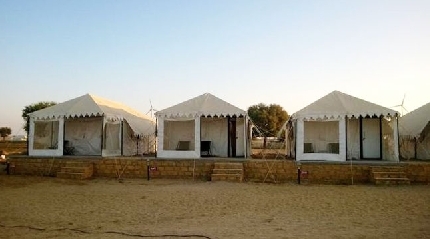 Likewise, the daily activities at the desert camp are all influenced by the traditions of Jaisalmer, which make you stay connected with the culture of the city, without pulling on the luxury quotient. 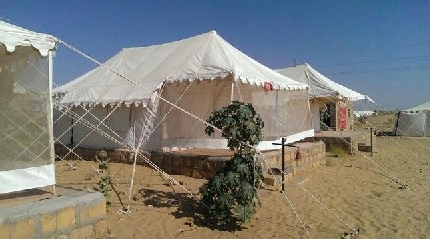 Ratnawali desert camp makes sure its guests do not go back complaining at any cost. Be it a sole traveler, a romantic couple or a fun loving family, the desert camp takes care of everything. 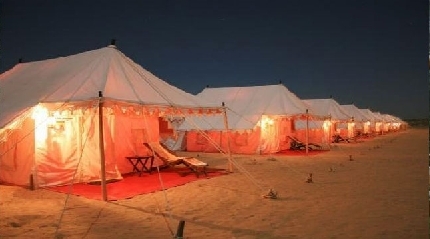 Within a total of 20 rooms, accommodations at the desert camp are high on luxury. Divided as single, couple and family accommodations, rooms at the camp are swiss designed and equipped with numerous amenities of modern living and comfort. Not just that, all the rooms at the desert camp are attached with a private sit out. Thus, one can have a nice time enjoying his morning coffee or the evening snacks sitting here. In order to make the guests taste the best servings of Rajasthan, Ratnawali camp has an indoor restaurant which offers traditional Rajasthani cuisines. These mouthwatering cuisines are spicy and entirely vegetarian. In order to maintain the decorum and the true essence of the desert camp, open-air dinner can also be arranged at the premises. One can have a time of his life gorging on the delicacies, sitting around the bonfire, plus the company of folk dancers makes it a delightful affair. Ratnawali desert camp has a fully functional multi-cuisine restaurant, which offers a proper mix of Rajasthani as well as Indian cuisines. Special emphasis has been given on the dinner part as it provides the guests a luxury to dine in the open spaces of the camp. Dining around the bonfire also gives the guests an opportunity to mingle with others. Ratnawali camps are open for all-Adults as well as children. However, the management does not allow infants and children below the age of 5 years at their premises. Teenagers and young children can have a great time at the desert and village safaris. In order to cover the distance to Jaisalmer in a short span of time, one can board a flight to the city. However, flights to the Jaisalmer airport are limited and connects only from Delhi and Jaipur. Therefore, one can make use of the Jodhpur domestic airport, which connects the city from other parts of India like Mumbai, Delhi, Chennai, Udaipur and Kolkata. Unlike the airway, Jaisalmer’s rail connection very well links the city to the rest of India. Situated in the heart of Jaisalmer city, the railway station operates regular trains from Delhi and Mumbai. Parts of Rajasthan like Jaipur and Jodhpur are also connected to Jaisalmer. Highly luxurious, ‘Palace on Wheels’ also runs through the city. Being well centered in the state of Rajasthan, Jaisalmer roads give a good access to the various parts of Rajasthan. This includes prominent cities like Jaipur, Jodhpur and Bikaner. Both Jodhpur and Bikaner are close to 4 hrs away, whereas Jaipur is little far. Besides, buses of Rajasthan roadways and private travel agencies are excellent means to travel within the state. Being a desert camp near Jaisalmer, Ratnawali has a lot to do with the world renowned Sam sand dunes that surrounds it. Interested guests at Ratnawali are offered half day long desert safaris. Riding over the golden yellow sand dunes in a jeep can be highly adventurous for the urban dwellers. Besides, it’s a great way to get a first hand experience of the local culture of Jaisalmer. The safari can even be a whole day program on demand. Often a common sight in the deserts, camel rides are highly enjoyable both for the adults and children. Many people travel to this part of the world only to indulge in such expeditions. Riding on a camel’s back, you would be crossing different villages, which are remotely settled in the Thar desert. This offers the guests an excellent opportunity to enjoy desert camping at its best. It starts with the lighting up of bonfire, which is followed by traditional Rajasthani dance and music shows Quite like a merry making affair in the desert, just the way gypsies celebrate. Jaisalmer is located within a hot and arid topography of Rajasthan. Being in proximity to the Thar desert, the city is prone to extreme daytime temperatures in the summers. Rainfalls are a scarcity at Jaisalmer, even in the monsoons. Although it does rain in the monsoons, but with little effect. Post monsoons, the climate gets much favorable for camping in the desert. It all starts by September end or in the first days of October. With day temperatures dropping to an all time low since the summers, camping in the deserts certainly feels a lot more convenient. By the end of October, some level of chill starts settling in the environment. It’s like an announcement that winters are near. Winter season is also a favorable time to visit the deserts near Jaisalmer. Outdoor activities like camel ride and desert safari are best suited to be carried on during the winter season in Jaisalmer. Ratnawali camps are located in the middle of the Thar desert. Owing to which, day temperatures can get quite hot even during the monsoons or pleasant months. Thus, it is advised that one must carry certain essential requirements like a hat and sunglasses.